Feet are very important. Both front and rear feet are round and compact with thick, elastic pads and well arched toes. Flat feet are a major fault. Toenails are black and/or white in blackspotted dogs and brown and/or white in liver- spotted dogs. Dewclaws may be removed. Color and markings and their overall appearance are very important points to be evaluated. The ground color is pure white. 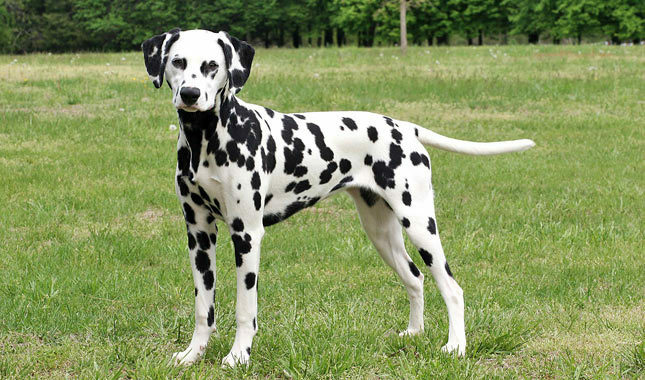 In black-spotted dogs the spots are dense black. In liver-spotted dogs the spots are liver brown. Any color markings other than black or liver are disqualified. Spots are round and well-defined, the more distinct the better. They vary from the size of a dime to the size of a half-dollar. They are pleasingly and evenly distributed. The less the spots intermingle the better. Spots are usually smaller on the head, legs and tail than on the body. Ears are preferably spotted. Tri-color (which occurs rarely in this breed) is a disqualification. It consists of tan markings found on the head, neck, chest, leg or tail of a blackor liver-spotted dog. Bronzing of black spots and fading and/or darkening of liver spots due to environmental conditions or normal processes of coat change are not tri-coloration. Patches are a disqualification. A patch is a solid mass of black or liver hair containing no white hair. It is appreciably larger than a normal sized spot. Patches are a dense, brilliant color with sharply defined, smooth edges. Patches are present at birth. Large color masses formed by intermingled or overlapping spots are not patches. Such masses should indicate individual spots by uneven edges and/or white hairs scattered throughout the mass. Click Here to see required genetic breed tests for dog breeds beginning with the letter D.
Click Here to Learn about breeder background checks on Dalmatian breeders if you are looking for Dalmatian puppies for sale. Click Here to learn how ResearchBreeder.com can help you find healthy Dalmatian puppies for sale. Click Here to order a Breeder or Kennel Background Check on Dalmatian Breeders that may have Dalmatian puppies for sale. Click here to find the national breed club for Dalmatian puppies for sale. Click Here to purchase a list of approved ResearchBreeder.com Dalmatian Breeders who have Dalmatian puppies for sale.